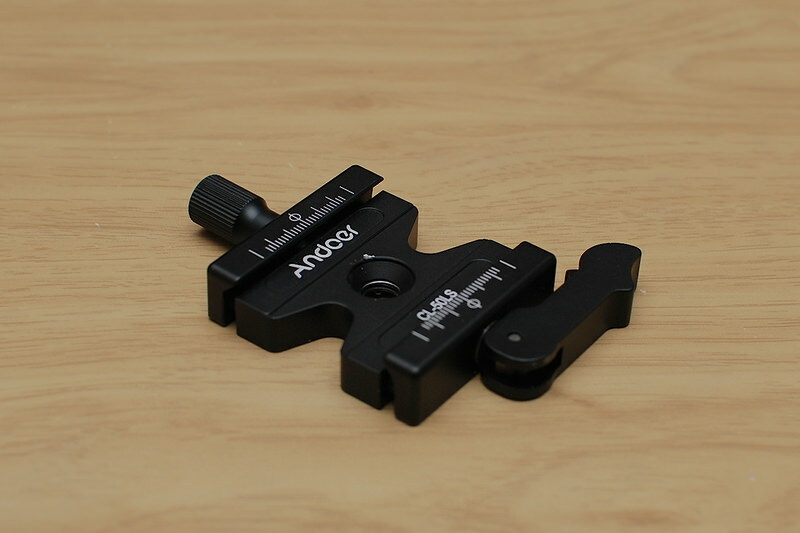 Andoer tripod head lever-lock Arca-Swiss comaptible clamp. I bought 2 of these, with 1 that would for sure be given a purpose. This is an Arca-Swiss compatible clamp that can replace another clamp or screw directly to a tripod or monopod. The advantage of this particular clamp is the lever-release. It retains a fine-adjust knob to get the clamping force right. But it operates with the lever. The lever rotates 180 degrees, with a half-engaged stop at 90-degrees. How it works is that the lever moves all the way closed and clamps an Arca-compatible plate. The knob allows to fine-adjust for differences between kinds of plates. There is a lever lock to prevent opening by snagging or unintentionally moving. Unlocking and moving 90 degrees to the first stop releases the clamp to allow moving the plate for balance adjustment, but the safety bumpers of the plate will stop equipment from sliding out entirely. Release the lever to fully open (squeeze the safety again to do this) and the clamp is fully open and the plate with your equipment can lift out. So that is the basic function, and it makes the Arca-Swiss clamp system a bit faster and easier to use. If you have a ball-head that where the entire quick-release can be removed from it, this can be used to replace that. Or, you can just mount it on to another quick-release screw with a thread adapter. 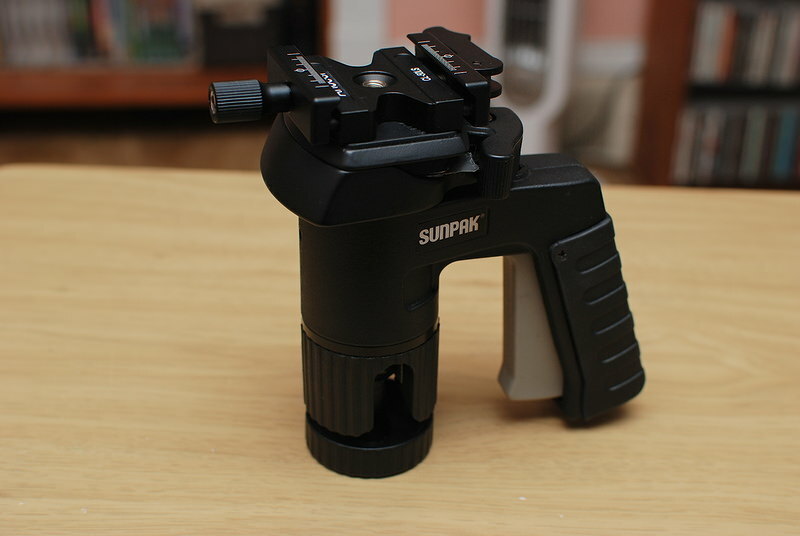 This is what I did to attach to my old Sunpak pistol-grip head. There was no other way to attach to this head, but it is functional. Now I can use this pistol-grip head in the future and simply use my now-standardized Arca-Swiss quick-release plates and L-brackets. The head has been transplanted to a compact and lightweight 4-segment leg tripod and can be easily packed in the field for a relatively steady long-exposure at a waterfall or something similar. The clamp itself is mostly metal in construction, but the lever's safety lock release is plastic, as well as the fine-adjust knob. But for $15 apiece with an included plate it certainly is well made. I now have a spare to use on another tripod or my monopod. I do have a backup-backup pan-head tripod that this could be put on if I need to pull out a third tripod to use like I did during the Great Eclipse.